Standard, 3.5mm headphone jacks have been default smartphone features forever. Apple molded the first iPhone — more or less the template for the most popular contemporary phones — after the iPod family, so of course headphone jacks were included. It’s fitting, then, that Apple famously (and “courageously”) broke that mold with the conspicuously jack-less iPhone 7 (and then, the iPhone 8 and the iPhone X). Though many of us wish these new phones still had analog ports, the motivation to upgrade remains strong, bolstered by daily iOS and app updates which demand more and more processing power. Those of us with newer iPhones (and even those of us considering an upgrade), are now largely forced toward pricier wireless headphones, with a few exceptions. 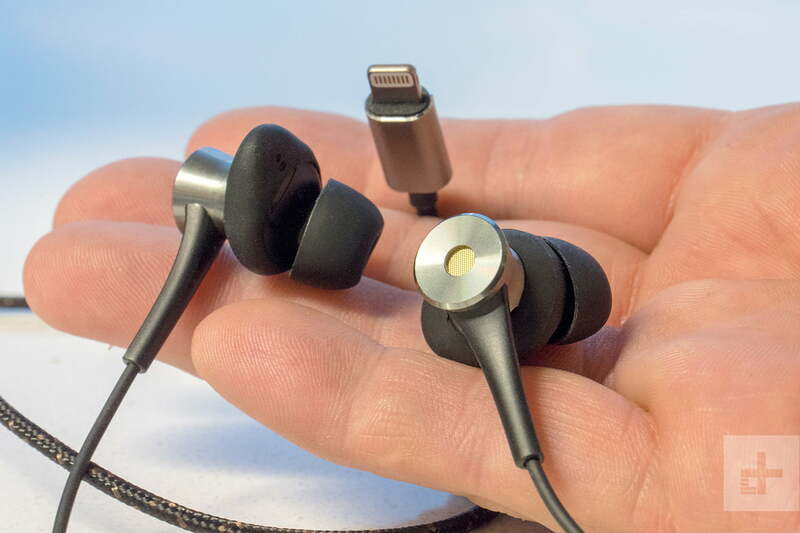 1More’s Dual Driver LTNG ANC In-Ear Headphones — really rolls off the tongue, right? 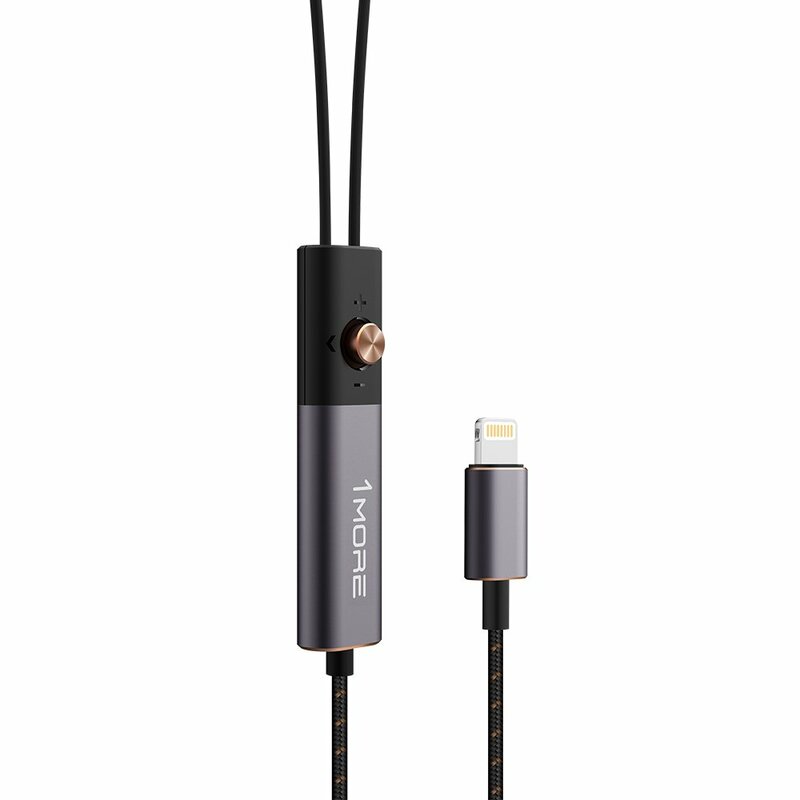 — stand as a prime example of those exceptions, designed to plug directly into a Lightning port, and even provide active noise cancellation. Priced at $150, these striking buds are far from flawless, but they’re good enough to compete in the fairly thin market for Lightning earphones. 1More has become something of a favorite at DT since we had the chance to review its excellent Triple Driver in-ears and the even better sounding Quad Driver. The China-based company has shown an impressive talent for crafting headphones with strong build quality, impressive audio clarity, and solid dollar value. If you have any experience with the Triple Driver or the Quad Driver, you’ll be happy to know the LTNG ANC buds are quite similar. The Dual Driver (not to be confused with 1More’s regular Dual Driver earbuds) are packaged with the same care and attention to detail you’ll find with the Triple and Quad. Inside a black cardboard sleeve, a magnetically sealed casing opens like a book to reveal hardware on the right, including headphones, a shirt clip, a little magnetic leather pouch, several sizes of silicone eartips and “secure tips” (read: wings), and some neat, da Vincian scribbles on the left which detail the headphones’ innards. It’s nothing new for 1More, but we always appreciate a good bit of presentation. Before using the Dual Driver, you’ll want to download the 1More Assistant app for iOS or Android, which offers two advantages: Firstly, a burn-in program to break in your headphones (1More suggests that some headphones need hundreds of hours to reach optimal performance; we think that’s a bit much), and secondly, the ability to import music and apply app-specific equalizers. We expect only the most detail-oriented listeners to care, though. You’ll notice we didn’t mention a battery above. That’s because, unlike most noise cancelling earphones, the 1More source power for their active noise cancellation straight from your phone. We didn’t notice any inordinate battery drain as a result, but your mileage may vary there. 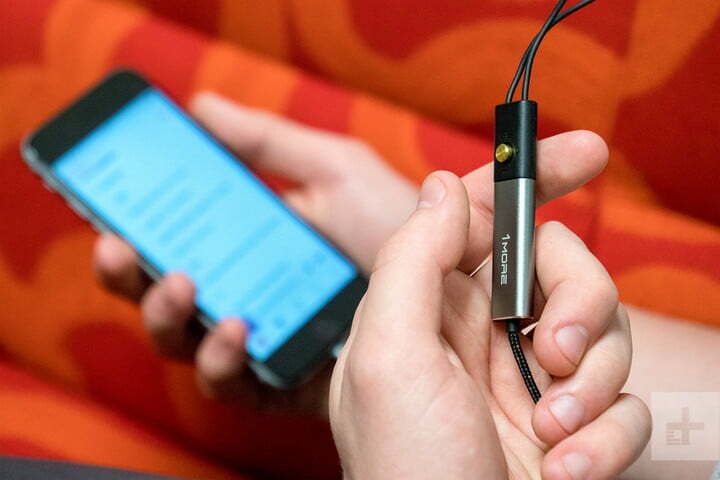 Physically speaking, the earphones feel durable, with a woven cable running between the Lightning connector and the inline controller. In total, the headphones are more than four feet long, which actually became annoying at times while trying to keep everything tucked in. The controller itself is home to an clever little joystick button — press in to play or pause, flick up or down for volume control, and left or right to skip tracks — as well as both the ANC toggle and the built-in digital-to-analog converter (DAC), which overrides the (worse) DAC in your iPhone. The joystick works pretty well overall, though it’s a little too easy to jiggle accidentally. If you’re wearing lots of layers or carrying something heavy with the cable against your chest, prepare to listen in involuntary shuffle mode. The Dual Driver themselves are nice; 1More eschewed the jet engine design used in the earbud housing for the Triple and Quad for something more rounded here, molded from spun aluminum alloy. Try enough combinations of eartips and secure tips, and you should be able to find a good fit (we did) but in our experience, the rather heavy controller pulls down enough to cause discomfort, even after just an hour or two. This can be remedied by using the included clip (or by awkwardly dropping the controller into a shirt pocket), but that’s a lot of effort, and clips are easy to lose. Also, since noise cancellation is dependent upon creating a seal, the controller’s weight can cause sound leaks if it starts bouncing around. The weight of the controller is understandable; since the headphones have a digital connection to your phone, the controller is the likely location of the the digital-to-analog converter and small amplifier required to turn that digital signal into sound. Still, we wish it didn’t affect the fit so much. Luckily, when you get a good seal the Dual Drivers’ active noise cancellation is pretty good. If you’re listening in a quiet environment — office, living room, etc. — turn it off, or you’ll be subjected to a very faint hiss which often accompanies ANC. On commutes, though, the noise cancellation is a godsend, effectively shutting out even the most obnoxious cars, trains, and crazy people on public transit. As the name suggests, each of the Dual Drivers’ earbuds contains two drivers, including one balanced-armature driver for the upper register and one triple-layer dynamic driver for the lower frequencies. While the earbuds have fewer drivers to take on the job than their siblings, the Triple and Quad Drivers (say what you want, 1More doesn’t mince words), we were pleasantly surprised at the richness and fullness of the Dual Driver’s sound signature. Bass response is measured yet omnipresent, offering a solid foundation upon which the Dual Driver thread warm, even midrange audio and crystal clear treble. Other than some odd, annoying static that appeared sparingly (seemingly without pattern or warning; we tried to reproduce this effect by plugging into different iPhones to no avail, so we can’t rule out our own phone’s Lightning port), the headphones perform well. The wobbly “anti-drops” in Louis The Child’s Last To Leave impart a sense of weight without introducing any distortion, and the Dual Driver show off impressive instrumental separation (and stereo imaging) in The Beatles’ Got To Get You Into My Life. They’re great for hip-hop — whether the dusty boom-bap of Joey Bada$$’s Christ Conscious or the piano-driven, nu-rap mumbles of Rae Sremmurd’s This Could Be Us, balance is impeccable, allowing details to leak through that you may never hear through your car speakers. While casual listeners may not notice a huge difference from whatever tack-on buds they’ve currently got equipped, and they’re not nearly as crisp as the $200 Quad Driver, the Dual Driver are strong enough across the board to earn a recommendation when it comes to sound — both what you hear, and what you don’t. For now, the market for Lightning-compatible headphones is maddeningly thin, and for a pair with noise-canceling earbuds, the 1More LTNG ANC might just be your best bet. While not without a few design flaws, if you’re in search of new earphones for your iPhone 7 (or 8, or X) that sound good and kill the noise, put these on your list.